Hey hey, welcome Science Fiction Fans! This blog is being used in an effort to show my continuing work on a famous sci-fi game called "Traveller". 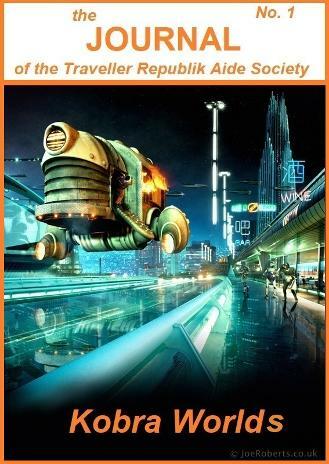 My main Traveller Republik (TrR) blog is located HERE. We want (and welcome) new people to work with us to create a galaxy wide Traveller set up. I work daily on TrR and have several other people helping me as well. We hope you enjoy this blog, that it may inspire you to greatness, and that you will possibly come and join us on the TrR team, excelsior! PS: this post will always remain on top, so please scroll down to see newer articles. The Anciene Republik is the remnant of a galaxy-wide state also by the same name. When the Emperor of the Republik died, it slowly lost its hold on the millions of worlds in the Milky Way, eventually stabilizing around the capital of Corfu and Olde Earth. 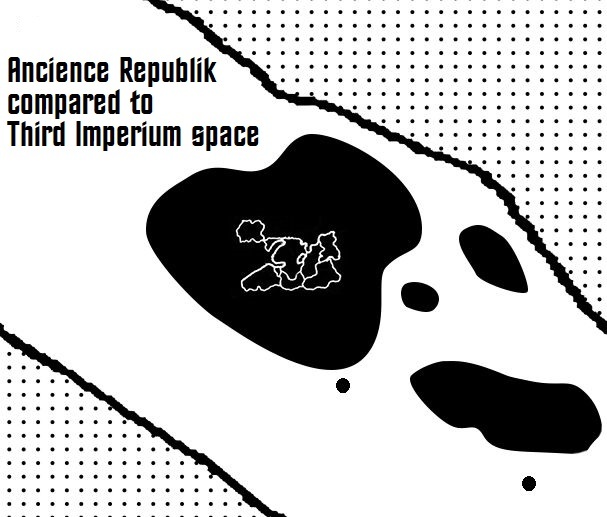 Currently, the Republik stands at around 55,000 worlds and has one of the highest technology levels known to man. The head of the government of this massive state is the High Premier and the Republik is a very militant organization. 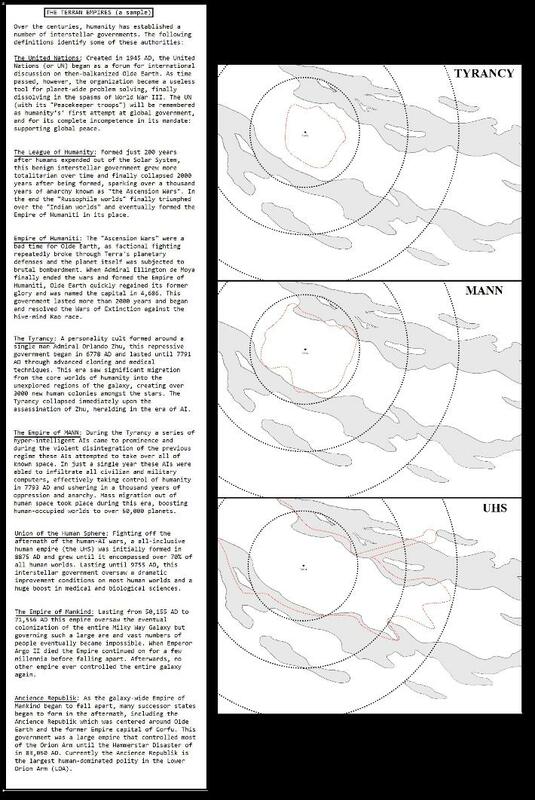 Okay I worked up some Urbanos Sector details and thought I would share. 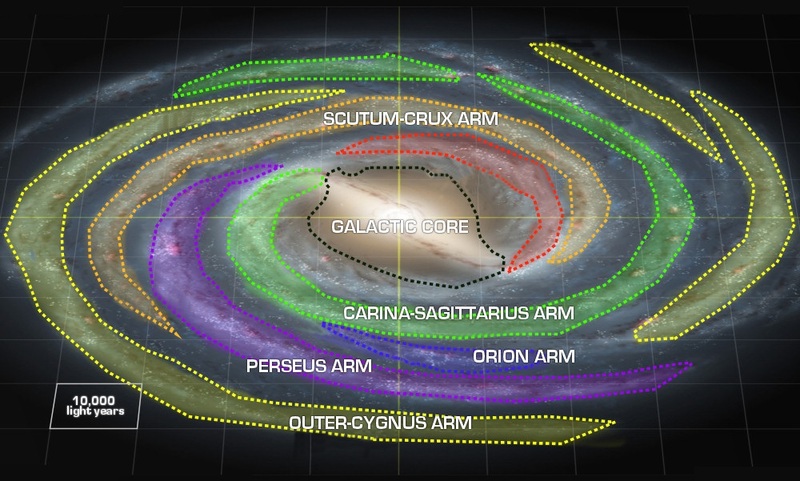 The extremely high population world of Urbanos is located in the lower Orion Arm spur of the galaxy. It has an enormous population, well over 100 billion people and is technically a city-planet, with the entire surface covered with one gigantic sprawling city. Urbanos, along with the other Big Four, have built up an coalition of planets, the Oceanic Alliance and is extremely high tech. The Minervans and the alien Bushi race are above tech level 18, making this Alliance extremely powerful. Unfortunately, it is also under attack, from two different directions by two completely separate enemies. For now, here is a map showing the largest populated planets in the Urbanos Sector. 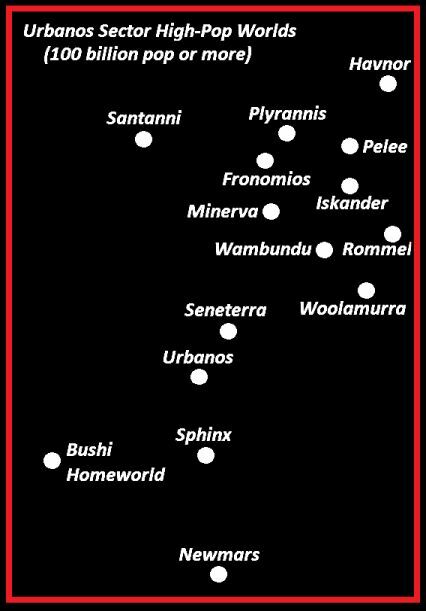 The graphic shown below is the location of the homeworlds of the "Big Five", the five most powerful and populated planets in the region. The Big Five initially formed the Oceanic Alliance, with the help of the AI named "Ocean", and their forces continually wage war against the nearby threats that have been so successful against the adjacent sectors. 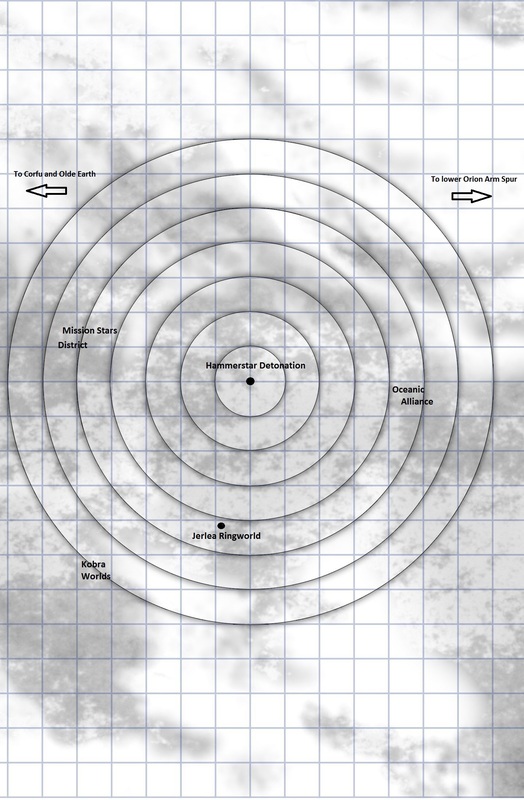 Each of the Big Five worlds have a population over 100 billion people and they lead a coalition of planets against the invading "Riders" and raids by pirates from several adjacent sectors. These planets wield extraordinary power because of their high tech levels and high-populations. "The "Originators" are considered to be the oldest alien races known to exist, and there are over a dozen of them. The oldest of them all is known as "the Fathers", and its been proven over and over that the Fathers spread humanoid life across our galaxy. On thousands of worlds in the Milky Way, humans and near-humans are located; most can interbreed with humanity's main stock from Olde Earth. Why the Fathers did this is unknown, but many of their technofossils remain, mainly in the Orion Arm of the galaxy. The Father's homeworlds, located in the Orion Spur, still have advanced defenses that automatically fire on any approaching ship or small craft, therefore they are off limits to every race. Hundreds of star systems have also been terraformed by the Fathers, and many are unique like the Castle System (with five habitable worlds), the Halden Diamond (four habitable worlds in a rosette configuration), and the fantastical Tyree "Zoo" (two dozen low-tech alien homeworlds orbiting the red giant Tyree in the Perseus Arm of the galaxy). Two additional alien races have colonized the Milky Way extensively and also left vast technofossils laying around, the P'zirr and the Mnxorn. Both of these races existed at the same time and apparently fought a genocidal war against each other. In the end, the reptilian Mnxorn were wiped out and the P'zirr Empire blasted back to a few dozen gas giant worlds, where they thrive to this day. Currently the P'zirr refuse contact with all other races, but the wreckage of their war can be seen across most of the galaxy. 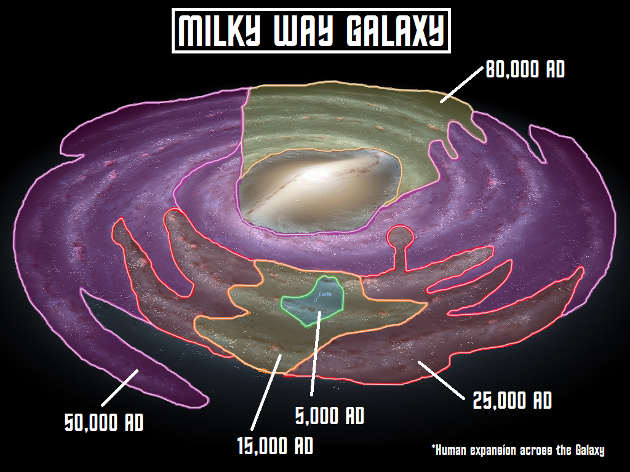 The last known ancient race that was extremely powerful and held significant influence on the Milky Way galaxy was the Makers, and a great deal of their technology is still around and functioning (and highly dangerous). They lived over 500,000 years ago and Maker technology is organic in nature, able to pervert any living thing they come into contact with into monstrous forms. Maker technology is worth enormous amounts of money, and is incredibly lethal to be around. 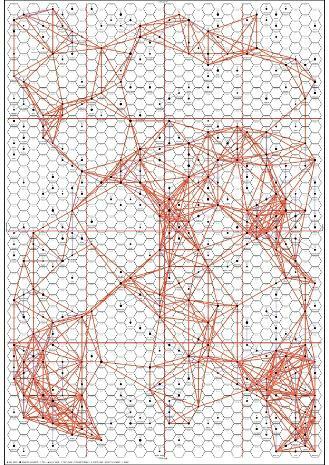 So, I was watching another website (I forget where) and he developed some pretty nifty software on how to create sector and subsector maps instantly from data. I was thrilled and went ahead and did the ultra-modern sector of Urbanos, and below is what it generated. 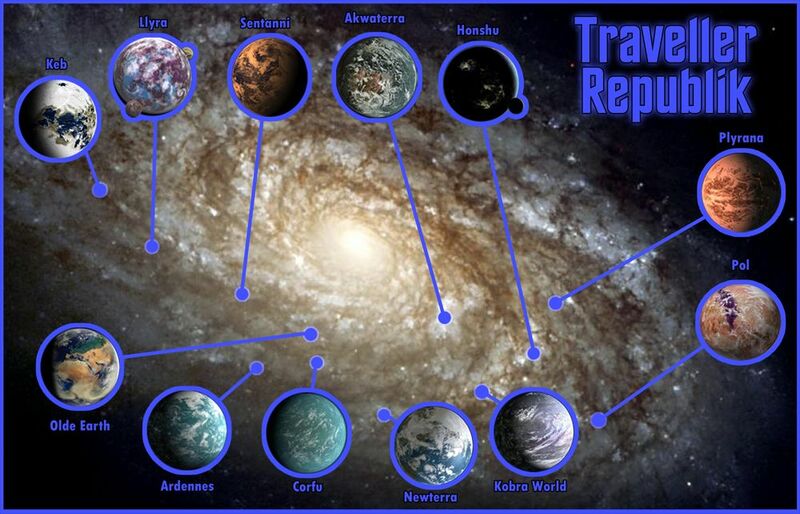 This map was so freakin cool it inspired me to work more on the TrR and its myriad of worlds. As you can see from the map, the major high-population worlds (the Big Five) have enormous trade routes surrounding them, going to and fro from these high-tech civilized planets. The revenues for trading among this cluster of worlds is enormous and the super-tech goods and information sharing between these planets helps the region continue to grow in leaps and bounds in the technological fields. So I have been working on the local map for a day or two, this is the region that our adventurers in the Journal of the Travellers Aide Society (Republik) will travel, from Kobra World to the Jerlea Ringworld, to Urbanos. This whole area is the Collapse Zone. The large circular area is the zone of devastation working its way outward from the center, where a hypergiant star went supernova. The "Hammerstar" was known to be unstable but very few people actually believed it would destabilize and even fewer realized that it would affect an entire area of the Milky Way Galaxy. This explosion was seen as far away as the Andromeda Galaxy and has inflicted hundreds of billions of casualties up and down the lower Orion Arm. Very few areas in the Arm have been able to sustain their economy or technology. The Minervans are humans who settled in the Urbanos Sector tens of thousands of years ago. They have always been heavily involved in the region. 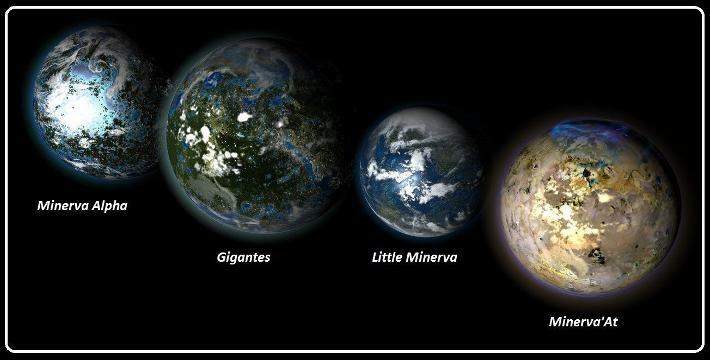 Below is a photo of the habitable planets in their system; Minervans are expert terraformers and Minerva'At is still being transformed. This artificial mini-world was constructed by the Ssli as a engineering test, and was paid for by the trillionaire businessman Marko Hickenlooper. Located in the Anciene Republik, visits to this worldlet are by invitation only. The Bushi are an ancient avian race that is highly aggressive and naturally xenophobic. Their homeworld is in the Lower Orion Arm, a jumbo-sized world with vast soaring mountain ranges and immense flat plains. Since they were flyers, the Bushi were mostly isolationist and and constantly engaged in warfare amongst themselves. Finally, over several millennia, they united as a world and ventured into space. Their interstellar empire grew until they ran across several species and using their superior breeding abilities they overwhelmed those three races (the Krim, the Alo, and the Barabo) and destroyed them, feeding more and more into the social xenophobia of the Bushi race. Over the next 400 years they made huge leaps in science and expanded their militant empire even further until they ran into the the human-dominated "Golden Empire" in _____, sparking the Starflyer War. At first, this devastating conflict was fought at long distances using automated weaponry by both sides but it was the Bushi Starflyer weapons that inflicted the most damage (and terror) on humanitys' side. The Starflyers' were organic-based ultrafast drones with planet-shattering warheads and could be fired at any planet within 1,500 light years of the Bushi Homeworld with a very good chance of success. Over 75 worlds in the Lower Orion Arm were badly damaged or destroyed by Starflyer strikes, but in the end humanity's enormous population advantage overwhelmed the Bushi by sheer numbers and ended the war in _____. The Bushi were reduced to forced isolation on their homeworld for thousands of years while humans slowly eroded their inward-looking xenophobia. Eventually the Bushi were allowed to join the new Anciene Republik and became an important member of that organization, making leaps and bounds in the organic sciences. They became expert terraformers and sold their skills to the highest bidder. In their home system, they realigned the environment of Bushi Prime and converted a smaller world (Bushi Minor) to a habitable one, with a future world (XX8f8) to be refashioned sometime in the next hundred years. 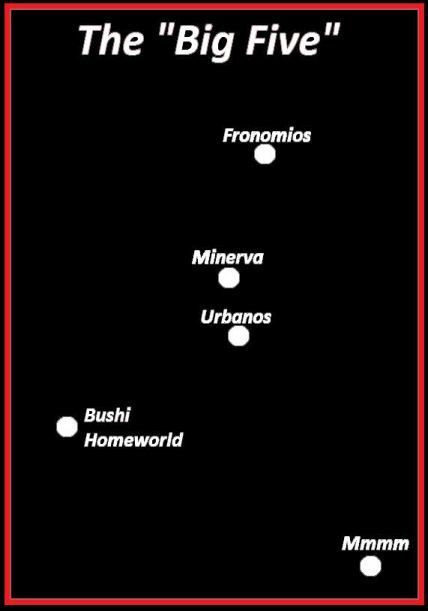 When the Hammerstar Disaster struck, the Bushi Homeworld was cut off from the Republik and joined the newly formed Oceanic Alliance as one of the Founding Worlds. By that time, interstellar trade was important to the Bushi and keeping their local region economically and politically stable was in their vital self-interest. By ______ their technology level had reached TL20 along with several other worlds within the Alliance, forming a growing synergistic hope for the future. The Tyrancy was a interstellar empire covering most of the worlds of mankind, lasting from 6778 AD to 7791 AD and its leader was the infamously brutal (and undying) Tyrant, Orlando Zhu. Born on the colony world of Rohan, his life was extremely difficult, losing both of his parents at a young age and being abused by employers as he toiled in an under-age factory. He joined the Empire of Humaniti military in its waning days and when the government finally fell apart, he staged a military coup on Olde Earth in 6778 AD. Although several other military and civilian competitors tried to take humanitys' capital from him, the Tyrant held on grimly for nearly a year until a significant majority of the armed forces eventually lined up behind him. He then went on to unite nearly all of human space under his direct rule, an era known as "The Tyrancy". Living almost a thousand years due to nanotech and advanced whole-body cloning, Orlando Zhu ruled with an iron fist and he also bribed various officials with life extension drugs which nearly doubled their lifespans. Sadly, they would die rapidly if they were taken off the drugs, making blackmailing and bribing them very easy. During his reign, he was assassinated several times but a new clone just replaced the old one, ensuring governmental continuity and his tyranny. A military genius and strong economist, he eventually moved the capital to Corfu, which was at the time an up and coming economic giant since the world was several times larger than Olde Earth and had a much larger population. Eventually, in 7790 AD officials within the government that were brutally subjugated by the Tyrant rose up against him and he was killed for the last time. His half-dozen dispersed cloning facilities were destroyed and a new civil war broke out to try and fill the role of leader. Eventually an advanced AI named "MANN" forcibly took over the reigns of government and ruled for the next 1,000 years with disastrous consequences for mankind.